A story that wants to be an homage to pulp with a literary approach, “Tom Silex, Spirit-Smasher” tells of a family approached by an agent looking to purchase the rights to their grandfather’s pulp creation, Tom Silex. Mamatas delivers successfully to some degree, working the symbolism from the pulps into the modern-day setting. A story that feels like a one-off (like there is potential for a richer experience lost in the speed with which it was written), “The Phylactery” tells of parents who recently gave birth to their first child, and the effect (or lack thereof) the child’s Greek history plays in its first few days and later, years. About a girl who is part of a team that takes bodies donated to science and slices them like deli-meat to create presentations on the human body, “Slice of Life” represents a once in a lifetime opportunity: in her dying moments a pregnant woman donates her body. Considering the story is a romance that takes place in a bar, it’s a bit of a forced idea, and perhaps not that intriguing for people who have seen The Body exhibition. Another romance, “The Great-Armoured Train” likewise plays with a bit of the real-world (Trotsky’s armored train) but mixes in a touch of fantasy (Polish folk-lore) to tell an engaging enough story that is one of the more purer forms of fiction in the collection, i.e. little to no commentary between the lines. A story that wants to be political but never comes to a point, not to mention a story that never completes itself from a plot perspective, “The Glottal Stop” is perhaps more a vignette than anything. Highlighting the ways in which people can target others online and react in extreme ways, it at least makes for a grounded view—politically charged but never fired might be the precise way of putting it. Continuing with the www theme, and making for one of my favorites form the collection, “A Howling Dog” looks at internet culture, particularly forums and comment sections, and the people behind them. Funnily acute. Dieselpunk in more than one way, “We Never Sleep” tells of an interesting scene wherein pulp writers wield propaganda power. Individuism one ethic drummed up by a writer of pulps, its impact on wider industry, including a semi-alternate history with Diesel himself, makes for unlikely yet interesting bedfellows. Deserving to be fleshed out in greater detail, one hopes Mamatas will return to this story and turn it into a novella or longer. “Lab Rat” tells of one man’s paid volunteering for a university psychological experiment that is, as one finds in the story notes, too realistic. Occupying about a third of the total content, the collection closes on the wonderfully satirical novella “Under My Roof”. 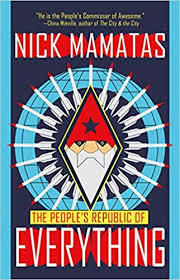 About a father and son who build a nuclear bomb, hide it in a yard gnome, and secede from the United States on political grounds, Mamatas takes the mercurial (to put it politely) political situation in the US today and works it into a tale that highlights the absurdity. An excellent way of closing the collection, the story brings all of Mamatas’ peanut gallery power to the forefront in the strongest way—a story Frederik Pohl or Robert Sheckley would be proud of. It's worth noting, to each of the above stories the collection adds what I think every collection or anthology of short fiction should: author’s notes. Adding that little extra foothold of insight into the stories, Mamatas’ are sometimes just as subtly funny as the story themselves, not to mention add the cherry of acerbic commentary the stories themselves possess the cake of. In the end, The People’s Republic of Everything is a solid collection of stories that, for the most part, carries on a dying tradition in science fiction and fantasy: satire. Nothing seeming to escape Mamatas’ sharp eye, everything from Lovecraft to Trump, genre to the internet is subject to witty commentary. Thus the collection comes recommended more for the genre driver than genre passenger. Mamatas’ writing style more on the workaday than smooth or rounded side, he gets his plots and points across in straight, simplistic fashion, yet with an underlying intelligence not always obvious. Stand outs in the collection for me were “We Never Sleep”, “Under My Roof”, the title story, and “A Howling Dog”. But for certain the cool kids debating further in the corner as we speak.